Global law firm Norton Rose Fulbright, together with EY has authored a report for the World Business Council for Sustainable Development (WBCSD) looking at Corporate Renewable Power Purchase Agreements (PPAs); created in collaboration with member companies of WBCSD’s Corporate Renewable PPA forum. The report walks companies through the opportunities that PPAs offer. It also addresses the obstacles corporate buyers and developers face as they plan and negotiate PPAs and proposes valuable solutions for corporate buyers and developers. The report takes a global approach highlighting countries that present the best potential for corporate renewables – such as Chile and Argentina or India. Norton Rose Fulbright is at the forefront of corporate PPA transactions having most recently advised Nestlé on its direct PPA for 50% of its UK demand. The firm’s global team continues to support key players on the upscaling of renewable energy procurement across multiple countries and regions. We believe that key markets for 2017 will include South Africa, Chile, Australia and Mexico. Hey Buddy!, I found this information for you: "New report encourages corporates to support renewable energy globally". 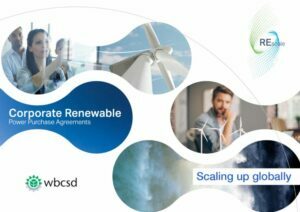 Here is the website link: https://www.duurzaam-ondernemen.nl/new-report-encourages-corporates-support-renewable-energy-globally/. Thank you.